In this week’s Spotlight on Social Enterprise, journalist Nadia Boyce investigates a twist on the social enterprise model that turns polishing crocodile belts into a path to financial independence. 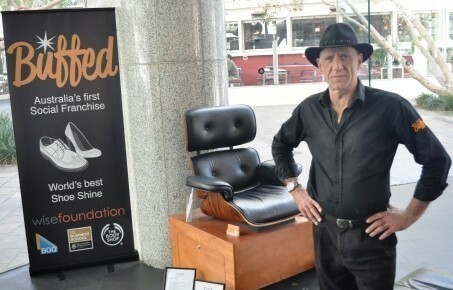 Growing national shoeshine and leather care social franchise Buffed is offering members of marginalised communities the opportunity to own and develop their own micro-business. Launched in November 2011 by founding partners, the Wise Foundation, Bank of Queensland, University of Queensland Business School and The Body Shop, the social franchise takes the targeted employment concept underpinning many social enterprises a step further and financially supports participants to own their own outlets. The Wise Foundation says it has a core mission of strengthening communities through assisting in the creation of innovative economic models and the social franchise has been developed to offer a comprehensive range of services. A drop off service, conference and event service and in-house service now complement the retail shoe-shining outlets. “We’ve had some unusual requests,” McDonald chuckles. Leather care tasks undertaken by the buffed team to date have ranged from couch buffing to polishing crocodile belts.Just last week, Buffed was asked to shine the shoes of members at the GABBA Ashes cricket test. The franchise’s foray into the shoe shining space has come after a period of careful development and planning for what is an experimental and unprecedented twist on the classic social enterprise. Alex McDonald is the Executive Director of the WISE Foundation and former Director and Chief Executive of the Big Issue in Australia. His experiences influenced Buffed’s development and growth. “I was personally involved with the Big Issue and saw the impact of microbusiness and small scale employment,” he says. “The genesis is that it’s a micro-business model that allows the opportunity to fully participate in the community by owning and operating a micro-business,” he says. Buffed identifies possible sites for its show shining stations, negotiates with building owners, manages branding and fit out and then works with community agencies to source people who want and will benefit from operating a site. Recruits are then trained and supported to operate at the retail level. Aspects such as fitout, branding and administration are taken care of to ensure franchisees have the best chance of success. Any control retained by Buffed is certainly not symptomatic of the organisation's broader philosophy, which is to give franchisees independence. McDonald says a key factor separates Buffett's business model from that of a classic social enterprise is personal agency – control of one’s own destiny appears to be at the crux of what buffed offers its franchisees. “We explore the concept of people actually owning the enterprise,” he says, with owners having flexibility and the agency not afforded to ordinary employees. This philosophy, he says, suits the organisation’s growing number of franchisees. “The primary focus is on migrants and refugees,” McDonald says. Currently franchisees do not have to outlay anything, with startup costs covered by the WISE Foundation. Buffed has expanded its frontiers beyond refugees and migrants in an attempt to get more women on board. McDonald conceded not also franchises are guaranteed to succeed. McDonald says it is not a major concern going forward. “We interview everyone that comes through. We don’t see it as a huge risk,” he adds. Buffed tries to minimise difficulties by providing ongoing training and support and managing expectations, he says. The social franchise has borne some solid success stories to date. An Ethiopian refugee and franchisee has money to send back to his family for Christmas for the first time, while another franchisee, who had previously not been employed for 17 years, now speaks of having a reason to get out of bed. “The job is there forever for him. He has been able to start paying into funds for his children,” McDonald says. The first years of operation have brought up some unexpected challenges and triumphs. “Social franchising is a very new concept. It’s a constantly evolving model as nobody has done it before,” McDonald says. Tweaks have been made to accommodate Buffed’s participants. “We thought in our initial survey that language wouldn’t be as big a barrier as it is,” he says. Branching out to conferences has also meant that many franchisees have to travel – a challenge, McDonald adds, for those new to the area. Public perception of the industry has been another hurdle. McDonald has been surprised at attitudes towards shoe shining. “People still have a bit of an outdated view of what it is,” he says. He says he sees people uneasy with the idea of having their shoes buffed by another, given the proliferation of cleaners, dry cleaners, tailors and other personal service industries in society. McDonald notes that Buffed has been tailored to Australian sensibilities as it has evolved, pointing out some differences between here and similar models the US. Something as simple as the location of the polishing chair has proven key. While McDonald says US customers are happy to have their shoes shone in public, Australians have proven to prefer sheltered alcoves that offer more privacy. McDonald says an advantage of social franchising over social enterprises is that it is inherently more scalable and able to be easily established in a suitable location. “People can come to us,” he says. A big part in Buffed’s success to date has been support, and McDonald does not underestimate how important that will be going forward. The organisation is currently searching for partners to assist them with key goals. “We hope to be represented in every city in Australia in the near future,” McDonald says. The other significant benchmark, he adds, is to have 100 franchisees around the country by 2015. They way McDonald looks at things, social franchising is giving those who may be disadvantaged the opportunity to seize the possibilities going forward. “It’s about people owning their own future,” he says.